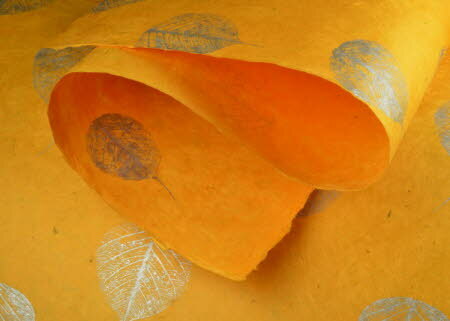 A silver handmade gift wrap paper, screen printed by hand with a repeating silver fig (bhodi) leaf pattern on saffron-coloured lokta paper. The sheets are medium-weight 30 inches by 20 inches - 55 gsm saffron-coloured natural lokta paper, produced and printed in villages in Nepal. The reverse side is saffron. The silver fig leaf pattern is taken from real fig leaves and this is a substantial standard weight paper, quite unlike the very soft Silver Leaf on Purple and Crimson papers.